EBAC's 13th Birthday - FREE event! | East Bentleigh Animal Care. EBAC’s 13th Birthday – FREE event! 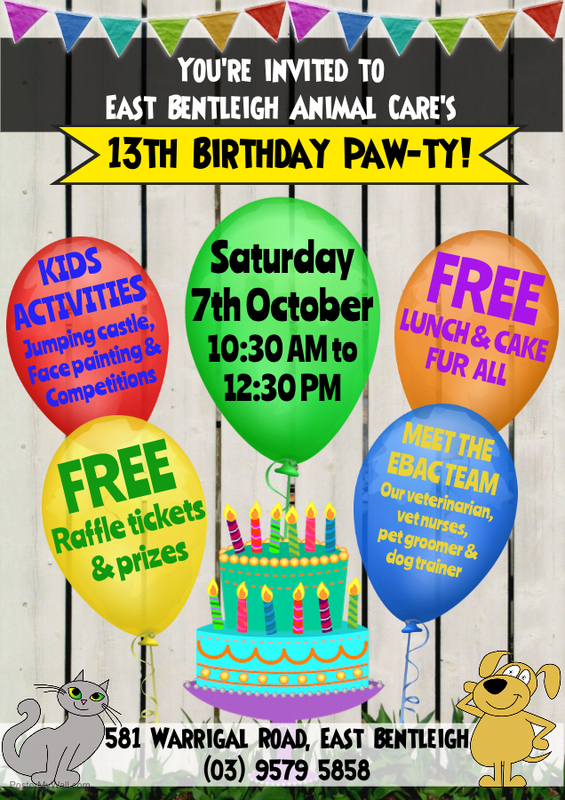 It’s East Bentleigh Animal Care’s 13th birthday paw-ty, and we’d like to invite you all to come and help us celebrate! There will be kids activities such as face painting, a jumping castle, various games and raffles, as well as other fun and interesting things for the whole family…And did we mention there’s FREE lunch and birthday cake! Howl could you say no?!?! This is also a great chance for you to meet our whole team who will be there on the day, and check out some of the interesting things that go on in a veterinary clinic! So make sure to save the date on your calendars, and bring your family, friends, and pets along for a purr-fect afternoon out at East Bentleigh Animal Care! For catering purposes, please RSVP for the event via calling, emailing or coming into the clinic.